Natural language processing (NLP) is an AI-based technology which is used for creating apps related to speech recognition, natural-language understanding, and natural-language generation. Some of the applications related to NLP are content classification, sentiment analysis, syntactic analysis etc. In this post, you will learn about how to get set up with a development environment for creating NLP based apps using Google Cloud NLP APIs. The steps below would help you get setup with Eclipse IDE and Java-based development environment for developing apps using Google Cloud Natural Language API. Create Google Project: Create a project by logging into Google Cloud console. I created a project such as NLP-Sample. Select the project that you just created. 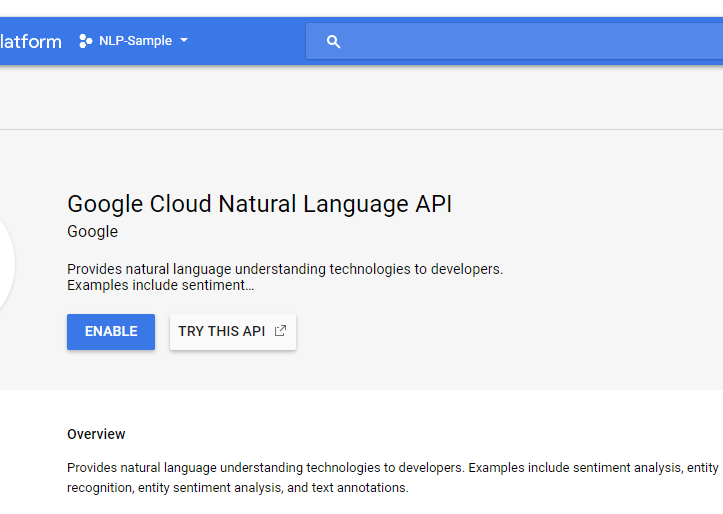 Go to Cloud NLP API Page: From Google cloud console, go to Google Natural Language API page by searching using the keyword such as “google cloud natural language API” as shown in the diagram below. Alternatively, go to Google Cloud Natural Language API page and select the project you created in the previous step. Enable Cloud NLP API: Enable the Google cloud NLP API by clicking on Enable button. The following screenshot represents ENABLE button. 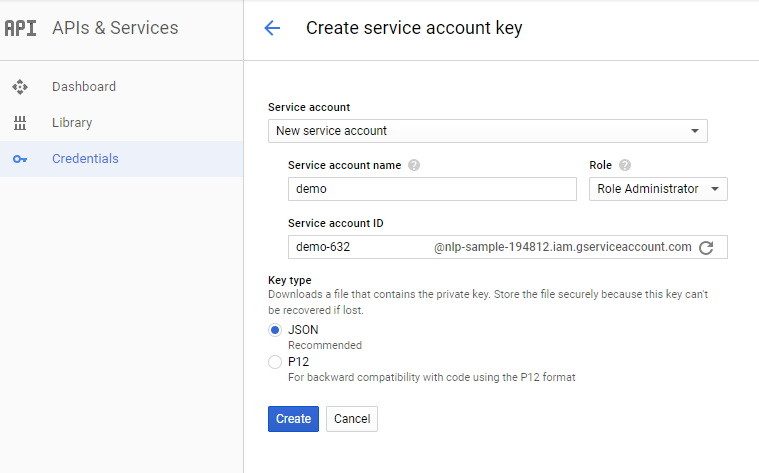 Create Service Account Key: Create Service account key using which you will access the Google NLP APIs from your Java programs. From Google NLP dashboard, click on “Credentials” link as shown in the left navigation. Then, click on “create credentials” and select service account key. Enter the details in the form as shown in the diagram below and submit. Include Google Cloud NLP API Dependency in POM: Put following in pom.xml file. Configure Google Application Credentials: Configure GOOGLE_APPLICATION_CREDENTIALS as environment variable whose value is the file path for service account key which gets downloaded as a result of creating credential as service-account-key. In this post, you learned about how to get set up with Google Cloud Natural Language API with Java. Did you find this article useful? 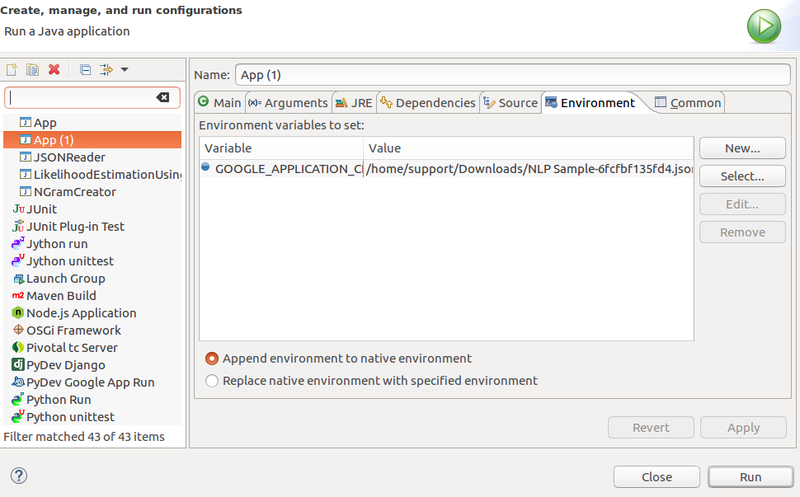 Do you have any questions or suggestions about this article in relation to setting up the development environment for Google cloud natural language API using Eclipse IDE and Java? Leave a comment and ask your questions and I shall do my best to address your queries.